Follow this link to enter the fantastic competition for Blog Candy. 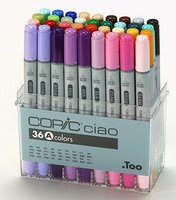 What a wonderful prize - Copics!! Sorry about the slow uploads of my crafty creations... a lot is going on.. My girls are turning 21 next week and i have loads of preparation to complete. Stay tuned... I will upload some more tomorrow..
How I wanted to get my hands on this guy! I know, I know... slacker eh!